I use Quickcrete and if your dimensions are the same as mine it will take one 80# bag and one 60# bag. I add a little Portland cement to make it stronger and easier to finish. Best to use a mixer if one is available. Mix concrete until it is workable. The less water you use the stronger your concrete will be. Fill mold till the cage is covered and vibrate by bouncing the mold on the floor. Fill the mold to the top and vibrate some more. Now you can cut your cage hanging devises loose and get rid of the pipes. Finish your work with a magnesium trowel. Put in place the threaded inserts. They should be centered 9″ from the end of the bench top. Clamp the hangers to the mold so they will stay in place. Tap the top of the bolt that holds the insert till the concrete works its way around the insert. Wait until concrete starts to set and finish it with a hard trowel. If you want to sign your work now is the time. Let set for 2 to 3 days. Turn your work over on boards or foam blocks. Take the nuts and washers off the mold bottom and lift the mold straight up. If the mold gets on the bolts it will scratch the finish. Take the corner bolts out and the mold edges will fall away. A view of this finished bench can be seen at the top of this website. 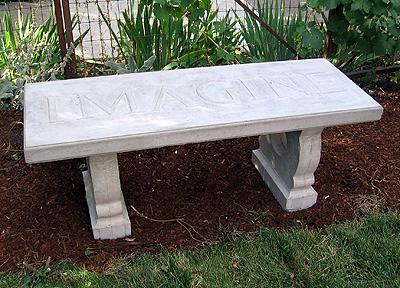 I have developed a great interest in building concrete benches recently and of all the research I’ve done on the topic, your site is by far the most interesting and informative. In addition, your benches are the classiest. Great work, and thanks for sharing this information. I am making cement benches for my Boy Scout Eagle Project. How are you attaching the legs. With screws or mortar? I can’t tell by the pictures. My feet do not have holes in them. Will mortar be okay to use? Thank you for your interest in our benches. I am some concerned about trying to fasten your benchtop to the legs with mortar. Mortar is usually not very strong stuff and if it comes apart and hurts someone you may be liable. Our bench top is fastened with a 3/8 inch bolt on each leg. There is an insert cast into the bottom of the bench tip to recieve the bolt whitch goes through a hole in the leg. If the legs are stable enough the mortar might be ok.